The Rochester Two-Jet is a two barrel downdraft carburetor that was produced from 1955 until the late 1980's. It was used at various times in every GM car and truck line, as well as GM-built marine engines and by other manufacturers such as Brockway truck, Checker Motors, Dodge and Plymouth (1971, 318 engine), Kaiser and Jeep (Buick V6), Studebaker and White Motors. The basic 2G design remained unchanged throughout its production run. The main distinguishing features are a power valve in the bottom of the float bowl, and a side hung float with the needle and seat inverted in the airhorn. The power valve is the same as used in the 4G four barrel and the accelerator pump is a similar design. In 1956, Rochester produced a special high performance 2GC carburetor for the Oldsmobile 88. This carburetor was more like the front half of a 4G than a 2G. Some of the design features resembled the earlier BB carburetor. A number of books and other references refer to the 2G as the front half of a 4G, or the 4-Jet as two Two-Jets back to back. This is only true in reference to the 1956 Olds 88 carburetor. The 2GC is the automatic choke version with the choke coil mounted on the side of the carburetor. 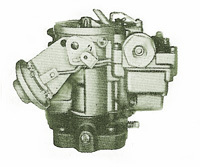 In early versions (1955 - late 60's) the choke thermostat assembly is attached to the airhorn (top part) of the carburetor. The choke coil is heated by hot air drawn through a tube connected to the intake manifold at the exhaust crossover or the exhaust manifold. This layout was used in marine applications into the late 1980's. In many cases, the hot air choke was replaced with an electric choke coil. 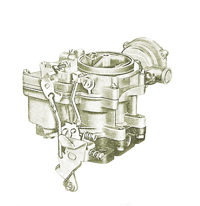 Starting in the late 1960's the choke thermostat moved down to the throttle body. This arrangement was used until the last domestic automotive application in 1979. 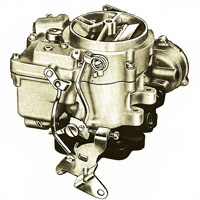 Another choke arrangement, used mainly on Chevrolet engines was the 2GV, in which the 'V' referred to the choke coil being remotely mounted on the manifold. Rochester 2G carburetors came in two basic groups: big and small. The small 2-Jets were used until the early 70`s, where they last appeared on 307 Chevy engines. Large 2-Jets, with a bigger bolt pattern, started in the late 60`s on BOP engines. By 1973, all automotive 2G`s used the large flange. Some classes of stock car racing need large Rochester 2-Jet carbs. These can be found on early 70`s Chevy engines, including governed big-block motors in school buses. The school bus carbs require modification to the throttle body assembly to be usable.